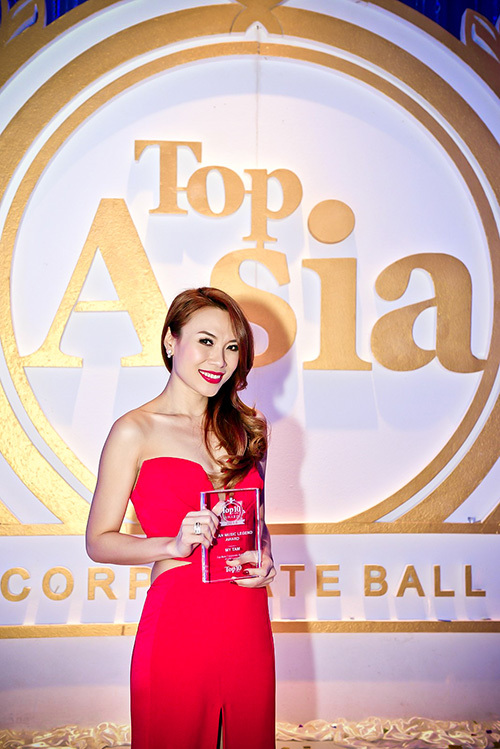 VietNamNet Bridge – Singer My Tam received the Asian Music Legend Award in Malaysia as part of the 2nd Top Asia Corporate Ball, which attracted 900 contestants from throughout Asia, last Friday. The event, held by the Top 10 of Asia Initiative – a Kuala Lumpur-based organization, aimed to honor the best singers from Asian countries. My Tam was the first Vietnamese to win the most prestigious music award in the region. Knowing that her chance was coming, My Tam came up with the idea to hold a concert in two big stadiums in Vietnam, becoming the first Vietnamese artist to have a sold-out stadium concert. The total expenditure for the two concerts was about VND30 billion ($2.5 million in 2003), and was the most expensive concert funding in the Vietnamese music industry. My Tam was crowned “No1 Pop Star in Vietnam”. After these concerts, her 3rd album hit 1,000,000 copies, which made it the highest selling album of Vietnamese recording industry. The album is certified 100x Diamond. The album is still in print in 2008 due to popular demand from new fans. In 2004, My Tam was the only Vietnamese Singer participating in the “Asia Festival Song” in Seoul, Korea. She wowed the Korean crowds with her 2 hits: “Wish” and “Oh First Kiss”. This motivated her to cooperate with Korean producers later in 2005. At the end of 2004, she had one more concert “My Childhood Home Town” and one tour “Live with Your Best”. Her fourth album “The Color Of My Life” was released in 2005. At the end of 2005, she had one more tour for students which was called “Power Of Dreams”. At this time, Vietnamese audiences did not only perceive My Tam as a singer but also a composer/producer as well. Many hits were written and composed entirely by My Tam: Oh First Kiss, How Come, Untold Love. My Tam re-released her fourth album with a pop/rock remix and another smash hit: “Duong Nhu Ta Da”, which she composed. The track was then re-recorded in Korean and appears on her fifth album. In 2006, My Tam worked with Korean producer Narimaru Pictures for her fifth album, Fly. She stated that she was unsatisfied with Vietnamese recording and studio techniques. She also took more vocal training, dance lessons, and expanded her music genres. In 2008, as part of her project "Melodies of Time", she created My Tam Entertainment (MT Entertainment). "Melodies of Time" has been planned to have five albums and a live show. She released her sixth album, Trở Lại (Come Back), on April 17. In April 2010, My Tam released her eighth album, named after her project, Melodies of Time. In a slideshow article by ABC News (America) in August, she was listed among 12 "ABC's Global Pop Sensations You've Never Heard Of". In May 2012, My Tam performed at the MTV EXIT concert at the My Dinh Stadium in Ha Noi. She was appointed MTV EXIT's representative in Vietnam. My Tam also served as a judge for the fourth season of Vietnam Idol. My Tam has a three-octave vocal range. She is a mezzo-soprano with a deep, powerful and clear voice that fits her into a variety of genres, including pop, dance and rock. She has won many local and international awards.